Note: This was a poster presented at the 145th Meeting of The Acoustical Society of America in Nashville, TN on April 30th, 2003. 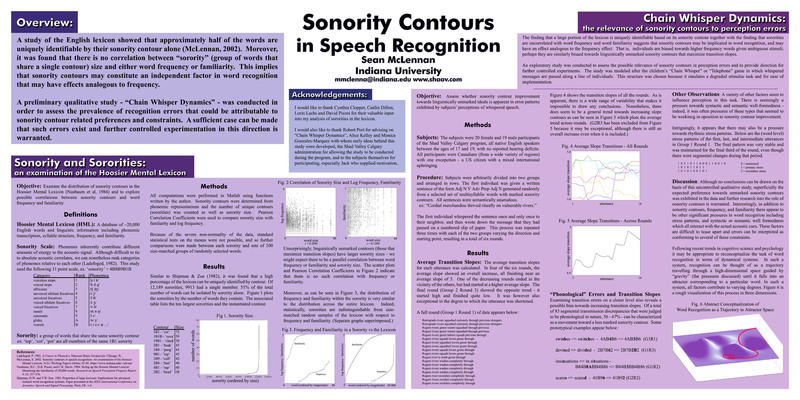 A section of the poster presents the findings of Sonority Contours in Speech Recognition: An Examination of the Hoosier Mental Lexicon. The remainder is a preliminary qualitative study of perception errors conducted at Shad Valley Calgary in July, 2002. The poster is available here as a JPG (~1.3MB). If you have any questions or comments feel free to E-mail me. Contrary to the Generativist distinction between competence and performance which asserts that speech or perception errors are due to random, non-linguistic factors, it seems likely that errors are principled and possibly governed by some of the same constraints as language. A preliminary investigation of errors modelled after the child's "Chain Whisper" game (a degraded stimulus task) suggests that a significant number of recognition errors can be characterized as an improvement in syllable sonority contour towards the linguistically least-marked, voiceless-stop-plus-vowel syllable. An independent study of sonority contours showed that approximately half of the English lexicon can be uniquely identified by their contour alone. Additionally, "sororities" (groups of words that share a single sonority contour), surprisingly, show no correlation to familiarity or frequency in either size or membership. Together these results imply that sonority contours may be an important factor in word recognition and in defining word "neighborhoods". Moreover, they suggest that linguistic markedness constraints may be more prevalent in performance-related phenomena than previously accepted. Ladefoged, P. 1982. A Course in Phonetics. Harcourt Brace Jovanovich: Chicago, IL. Nusbaum, H.C., D.B. Pisoni, and C.K. Davis. 1984. Sizing up the Hoosier Mental Lexicon: Measuring the familiarity of 20,000 words. Research on Speech Perception Progress Report N.10, 357-376. Shipman, D.W. and V.W. Zue. 1982. Properties of large lexicons: Implications for advanced isolated word recognition systems. Paper presented at the IEEE International Conference on Acoustics, Speech and Signal Processing. Paris, FR. 1-4.